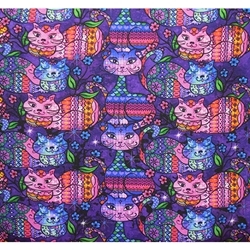 Deep purples with a superlative blend of greens, blues, and pinks form the cats on this cushion. The pattern portrays a subtle royal essence from afar and as you approach the cats become clearly visibile and designed beautifully. This double seat cushion has a seat flap on the back. The foam inserts in this double cushion are roughly three inches thick. There is a handle on both ends of the cushion for ease of carrying. Each cushion measures 13x13.5x3". Two of these are fashioned together by 2.5" of patterned fabric.